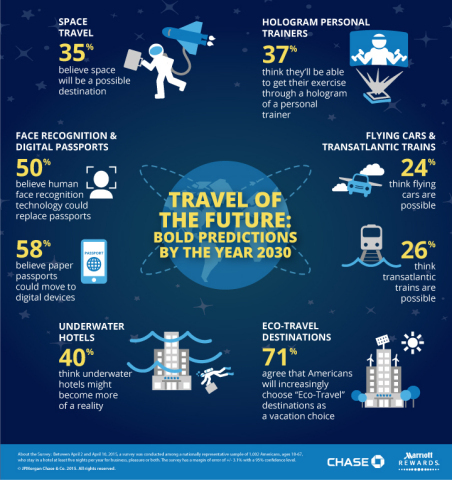 WILMINGTON, Del.--(BUSINESS WIRE)--A new survey unveiled today by Marriott Rewards Credit Card from Chase asked Americans to imagine the near future and predict what the travel experience could look like. Their top predictions reveal some surprises. “From advancements in technology to new destination and experience opportunities, the way we travel is ever evolving,” said Vibhat Nair, general manager, Chase Card Services. “As travel becomes more advanced, we are making it easier for travelers to earn credit card reward points for the trips they are taking today, and to put toward their future travel.” To align with the unique needs and preferences of travelers, Chase offers its Marriott Rewards Premier Credit Card, which lets travelers earn Marriott Rewards points on all purchases, accumulate free night stays and accelerate status. Plus, the card offers EMV chip-and-signature technology, charges no foreign transaction fees and comes with a variety of travel benefits.